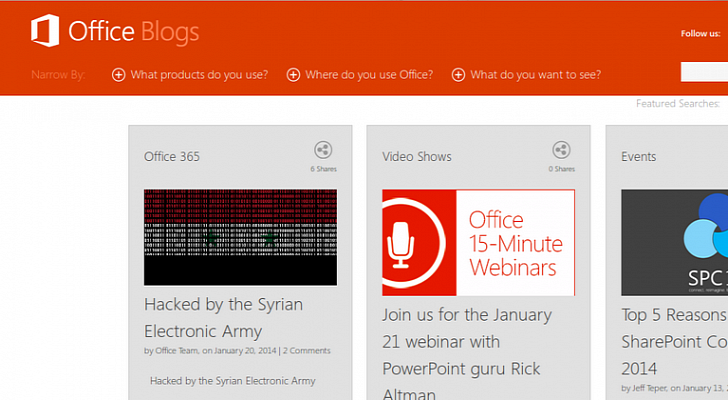 Recently, Microsoft got hacked by the Syrian Electronic Army. Hackers have been attempting from the start to compromise the different resources of the company including official Xbox accounts in social networks and Skype. This time their target was official blog Office, which they successfully hacked. This might be some case of showing one side of the picture that they were testing the security of some other platform of Microsoft, or they might be something else. This thing is cyber crime and guilty persons must be imprisoned. Today Syrian electronic army hacked the Mircosoft Office Blog. Hackers were only able to make some changes in one of the posts in the blog by leaving a message: "Hacked Syrian Electronic Army" as shown in the Image. The recent increase of these hacking attempts clearly indicate that Microsoft needs to take better care of the security of their own resources and install some heavy end firewall system to the Administrator end of their websites. Officials of the Microsoft have issued a press release of the incident been taken place. The documented report shows that none of the user data was compromised. Now the Office blog is operating normally as it was and all the hacking attempts are cleared and malicious post has been removed.